Speakers at Indian Blood included (left to right): Roshanna Toya (2L), Pueblo of Isleta Appellate Court; Professor Christine Zuni Cruz, Associate Dean for Institutional Climate and Equity, UNM School of Law; Paul Spruhan, Assistant Attorney General for the Litigation and Employment Unit at the Navajo Nation Department of Justice: and Dr. Lloyd L. Lee, Associate Professor, Native American Studies Department, University of New Mexico. 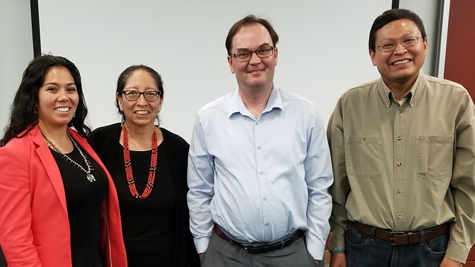 Representatives from the Pueblos of Isleta and Laguna as well as the Navajo Nation joined members of the UNM Law community for a forum titled “Indian Blood” at the law school on November 8. “Indian Blood” was organized and sponsored by the UNM Native American Law Student Association (NALSA), with assistance by the UNM Law and Indigenous Peoples Program and the Indian Law Section of the State Bar of New Mexico. Its purpose was to educate the public and create a dialogue about Indian blood quantum-based membership standards and enrollment issues for Pueblo and other tribal peoples. Associate Dean Christine Zuni Cruz presented the keynote speech on the “Law of Belonging and Relationships,” summarizing her groundbreaking research and theorizing with respect to tribal enrollment and indigenous identity issues. The issue of using Indian blood quantum standards in tribal enrollment criteria is among the many issues that will be explored again in a symposium this spring. 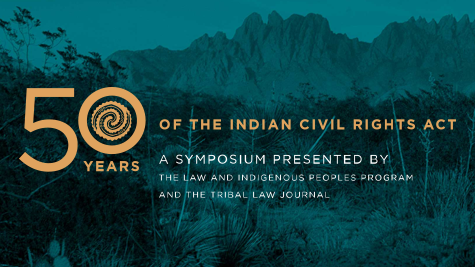 “50 years of the Indian Civil Rights Act,” presented by the Law and Indigenous Peoples Program and the UNM Tribal Law Journal, will bring much needed attention to the protection and denial of the civil rights of Native Americans in the fifty years since Congress passed the Indian Civil Rights Act in 1968. The symposium will be held March 8 and 9, 2018 at Isleta Resort & Casino in Albuquerque.